Solid State Drives or SSD are becoming more and more popular nowadays, not to mention prices are also going down. The market has become very competitive and many manufacturers are targeting the different market, from value SSD, mainstream SSD to high performance SSD. Today, let’s take a look at ADATA’s XPG SX900 256GB SSD featuring a LSI SandForce controller, Micron Nand Flash and a SATA 6 Gbps interface. 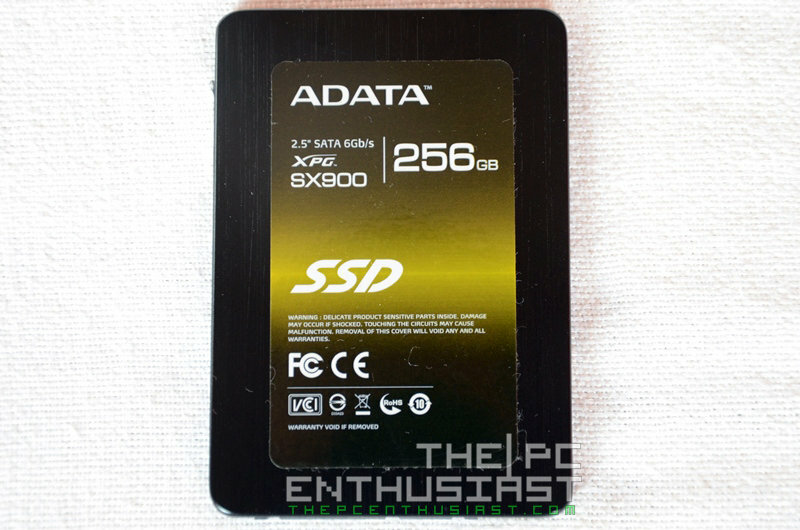 Please continue reading my ADATA XPG SX900 SSD review below. 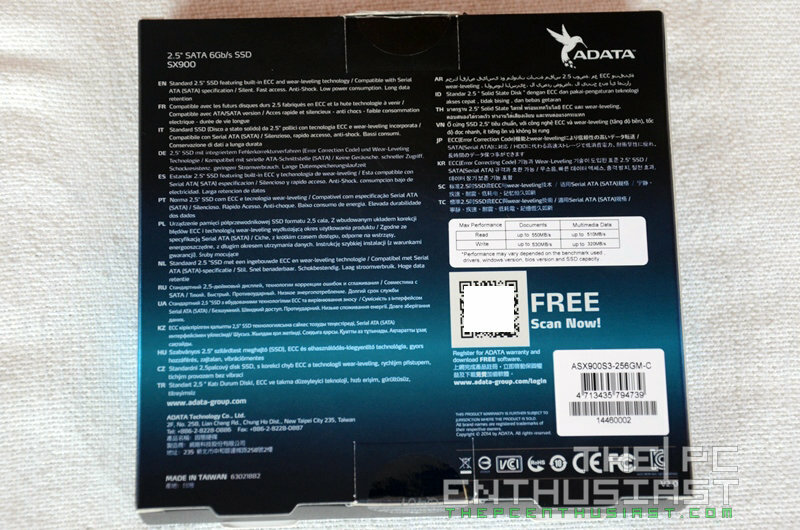 The ADATA XPG (Xtreme Performance Gear) SX900 is not actually the company’s latest solid state drive. For the high performance SSD, the company’s latest is the XPG SX910 and for the mainstream variant, they have the Premier Pro SP920. The XPG SX900 is available in 64GB / 128GB / 256GB and 512GB capacities. Higher capacities may have higher performance compared to a lower capacity SSD. The XPG SX900 features SandForce 2281 controller and according to ADATA their series offers a 7% increase in capacity compared to other SSDs in the market that use a SandForce controller, usually it’s only 240GB instead of 256GB. The newer SX900 also supports Windows TRIM command. The 256GB variant has a total formatted capacity of 238.47GB in a NTFS File system format. Check out more information from the specifications table below. 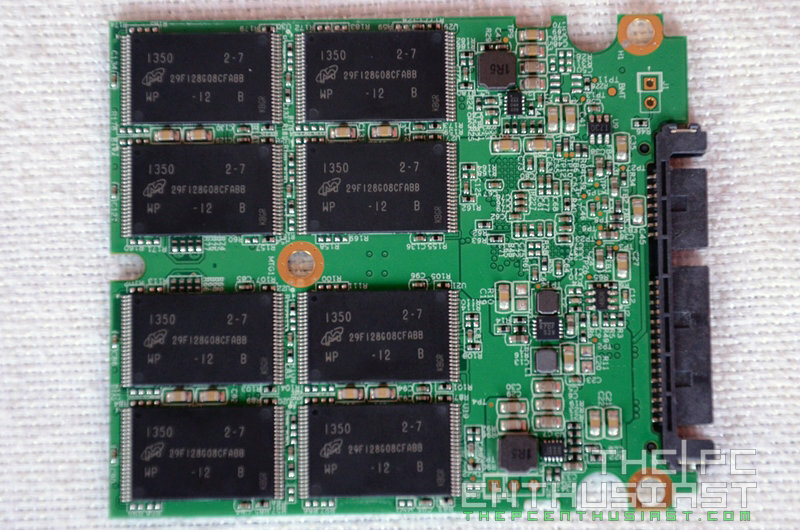 Now let’s take a closer look at the XPG SX900 256GB SSD. I’ll explain more of its features as we proceed with the closer look below. 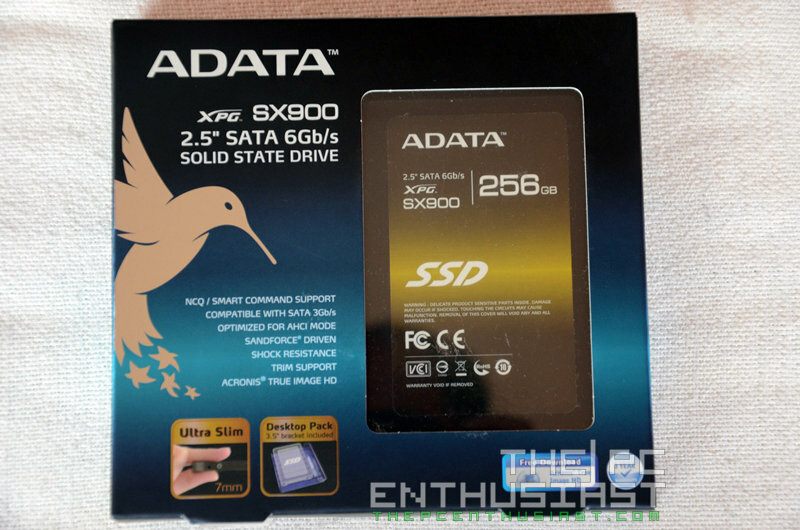 The ADATA XPG SX900 SSD comes in a nice box and packaging. There is a window in front of the box where you can see the front of the SSD. At the back of the box are lines stating some of its features in several different languages, as well as its potential read/write speeds. There is also a QR code for free Acronis software. Inside the box of the SX900 are the SSD itself, a quick start guide, a 2.5″ to 3.5″ adapter/bracket, some screws and a 2.5mm-thick fitting so that you can install this 7mm-thick SSD to a 9.5mm slot. The adapter is very useful in case your PC case or chassis doesn’t have an SSD mount. The XPG SX900’s enclosure is made of aluminum casing with an aluminum-brushed finish. 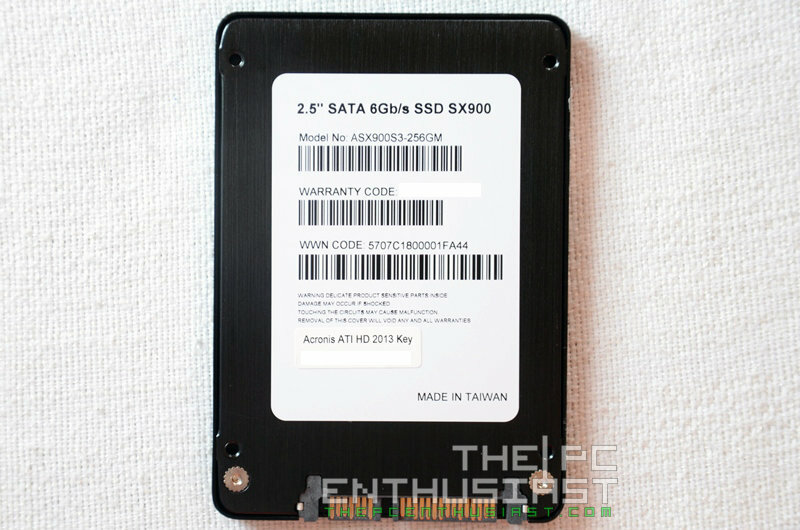 The rear portion of the SSD is where the model number, warranty code, WWN code as well as an Acronis ATI HD 2013 Key can be located. I’m not sure if all SX900 comes with a free Acronis software. I’ve seen older models and they don’t have a free software. The photo above reveals of what is under the hood of the SX900. After removing the top cover, we can immediately see 8x Micron NAND Flash. More are revealed after fully separating the PCB from the casing, since the controller and other NAND Flash chips are located on the other side. The ADATA XPG SX900 256GB SSD that I got has a total of 16x Micron 29F128G08CFABB WP-12 B NAND Flash memory chips, that makes the 256GB capacity. The 128GB variant has only 8 of these on one side only. I noticed also that not all models of the SX900 use the same Micron NAND Flash. Some models use SanDisk NAND Flash while others use an Intel MLC synchronous NAND flash memory. The SX900 also uses a LSI SandForce SF-2281VB2-SPC controller. Not all SandForce controllers are the same. The newer models are usually better, faster and more efficient. Now it’s time to see how fast or extreme the SX900 really is. When testing the XPG SX900, I am using an Intel based system powered by a 2nd generation Intel Core processor. 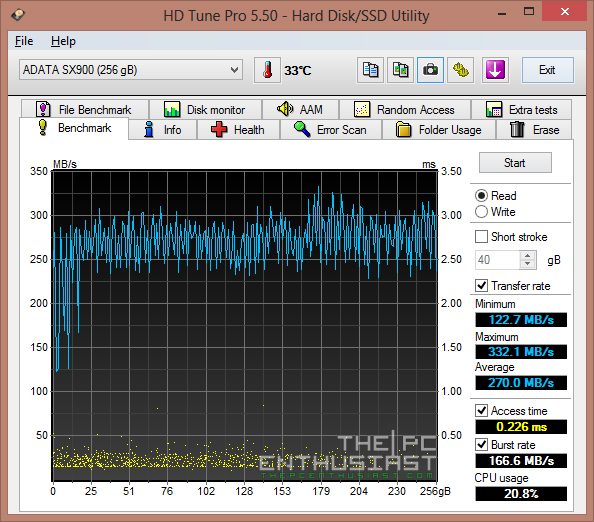 I also used five different benchmarking tools to determine the performance of the SSD. Initially, the firmware version of the SX900 is 5.0.7b. I updated its firmware to the latest version which is 5.2.5, since newer firmware usually improves the overall performance of the SSD and might have fixed some issues with the old firmware. The SX900 was plugged in a SATA 6Gbps port using AHCI (Advance Host Controller Interface) for a better and faster performance. 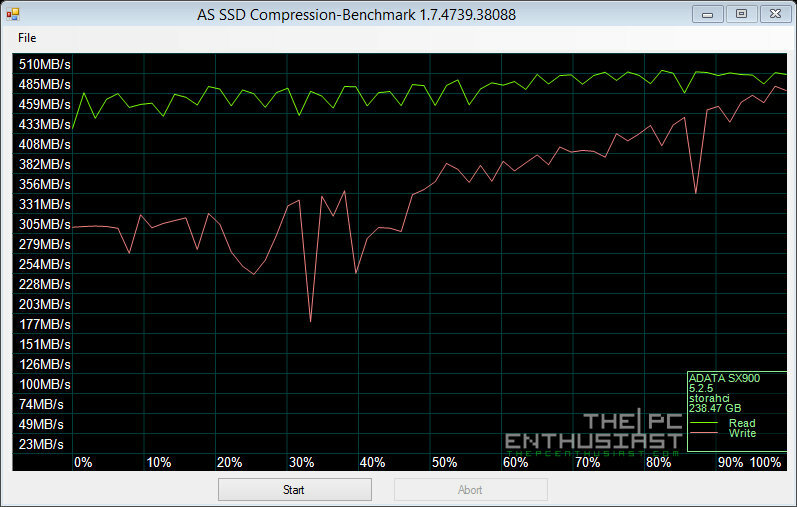 Also while benchmarking the SSD, it was not populated with any files, meaning it has a 100% free capacity. Below are the specifications of the test unit. I would also like to add that results may vary depending on the system and PC components used, as well as the benchmarking tools. You may not get the same results compared to my test, or better yet, you might get higher results if you have a better system. Below is the benchmark result using ATTO Disk benchmark. This is same software that ADATA used to benchmark their SSDs. In my test I got almost 514 MBps write speed and 544 MBps read speed, which is not very far from the ATTO result that ADATA declared in their specs sheet. The next test is using HD Tune Pro version 5.50. During the test the drive was not formatted. Rather, I have un-formatted it or deleted the volume since you cannot do the write test if the drive is formatted or is populated with any files. You will get an error message saying “Writing is disabled.” The results were far from the ATTO benchmark results. Maximum read speed was only 332.1MB/s and the maximum write speed was only 328.2 MB/s. That is already far from the 500MB/s margin, not to mention the graph shows that it is not writing or reading on a consistent speed. Below are additional test using the File Benchmark test of the HD Tune Pro. Now let’s move on to another benchmarking tool. This time I am using the CrystalDiskMark 3.0.3 x64. In a 1GB test, I manage to get a sequential read speed of 459MB/s and sequential write speed of 323.1 MB/s. That is still far from ATTO’s benchmark result. But never the less, it’s better than HD Tune Pro’s result. Now let’s use a benchmark tool that is frequently used for testing solid state drives – the AS SSD Benchmark tool version 1.7.4739.38088. The results I got are closer to the results I got using CrystalDiskMark. The sequential read speed went up to 480.38MB/s, but the sequential write speed went slightly down to 312.46MB/s. Well, I didn’t expect that the result would be similar all throughout the test. But at least the results are close, giving us the idea that its true speed is somewhat is in this range. Below are AS SSD Copy and Compression benchmark. The tool generates a temporary file while doing these tests. 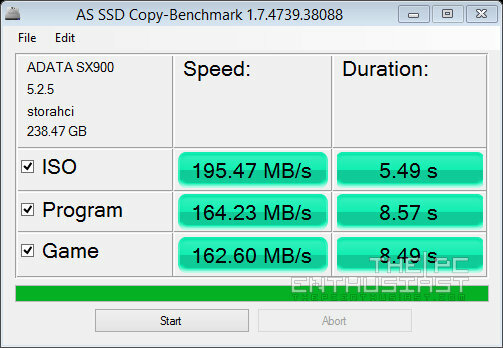 Finally, I used Anvil’s Storage Utilities SSD Benchmark to test the ADATA XPG SX900 256GB. This is a great tool and gives us more benchmark information compared to the CrystalDisk and ATTO. While using Anvil’s benchmark tool, I got a sequential 4MB read speed of 471.45MB/s and a sequential 4MB write speed of 312.10MB/s. The ADATA XPG SX900 256GB is currently priced at $153.93 $114.99 on Newegg. Meanwhile, the 64GB variant is currently priced at $90.99 $64.99 , the 128GB at $111.66 $77.99, and the 512GB capacity at $285.41 $233.99. Getting one 512GB SX900 SSD is the better deal than getting two 256GB, unless you are going for a RAID configuration. Meanwhile, the newer and faster XPG SX910 Series are currently priced as follow: $240.45 for the 128GB, $310.45 for the 256GB, and $590.45 for the 512GB. Note: Prices are updated as of February 1, 2015. The read and write speeds were somehow consistent with the last three tools that I used. The results, although not very near from the target 550MBps read and 530MBps write speed, are also acceptable for a high performance SSD. I admit, the results area somewhat low compared to other SX900 256GB tests conducted by other reviewers. Currently I can’t conclude if this has something to do with test system or if it has something to do with the different NAND Flash used in other models. But I am going to run the tests again when my new Z87 test system arrives very soon. Comparing it with my old Samsung 830 SSD, I can say that there is a significant improvement in terms of performance. When in gaming, loading times are cut significantly compared to games that were installed on a hard disk drive. I also noticed a significant improvement while editing large size photos and editing videos, loading and rendering are faster. Aside from performance, I also like the Aluminum brush finish since it goes with the black interior of my case. I have to emphasize that not all XPG SX900 are made with the same components inside. Like I said earlier there are models that do not use the same Micron NAND Flash chip. Older batch of SX900 might not perform as good as the newer ones. 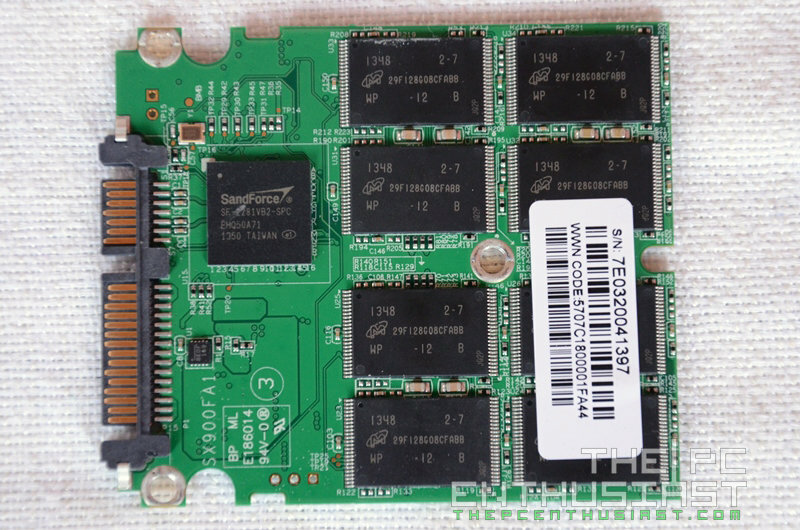 If you are planning to buy two or more of the SX900 SSD, make sure that they are of the same model series and uses the same components inside, otherwise this could greatly affect the performance of your RAID configuration, specially RAID 0. Honestly, based on my tests, I wouldn’t say that the ADATA XPG SX900 is one of the fastest SSDs on the market, rather I think it belongs to the mainstream or mid-tier SSDs. I’ve seen other SSDs perform better than the SX900 but they come in a much higher price tag. The 256GB variant of the XPG SX900 is currently at $153.93 only, which I think is already a very reasonable price for a 256GB capacity. The downloadable Acronis software included is also a plus factor, not all SSDs come with a free software or utility. Basically, based on its current price and performance, I am impressed with the ADATA XPG SX900 SSD, and deserve The PC Enthusiast’s Highly Recommended Award. Hi, What do you think about the 128gb version? It performs better rather with adata sp920 128gb? I expect that the 128GB version will be slower than the 256GB variant. Usually the higher capacities are the faster ones. Most of the time companies do not emphasize this on their product page. They just used the term “up to” XXXMB/s. But the truth is lower capacities tends to be slower than the higher capacities.